Inspired by the famous MAD character, Alfred E. Neuman, Happy Half Wit stands about 25 feet in height and makes his home outside Ken&apos;s Mufflers (830 South 11th) in Beaumont, Texas. Happy is one of four muffler men purchased by Ken Johnson for his muffler shops in Dallas, Texas. While two still remain in their original Dallas locations, one has gone missing and ours has made his home here in Beaumont for quite some time now. Happy Half Wit is unique for a couple of reasons. For starters, he&apos;s a half wit, which is one of the less common variations of muffler men you&apos;ll find scattered around the United States. Secondly, he&apos;s holding a muffler. Considering the name, this is surprisingly rare when it comes to muffler men. Today, most aren&apos;t holding anything. Others can be found holding a variety of items including an ax, a hot dog or a baseball bat, among other things. 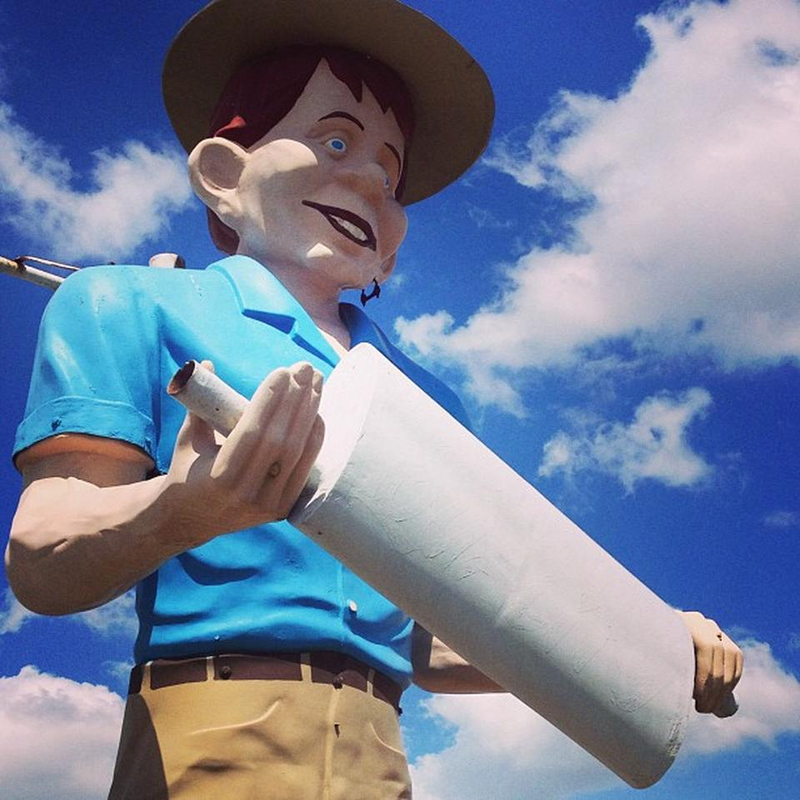 Standing 18 to 25 feet tall, Muffler Men is a term coined for these human-like giants that dot U.S. highways. They were originally designed to promote various businesses around the country and are usually made of fiberglass. Muffler Men made their first appearance at the Paul Bunyan Café on Route 66. Built in 1962, a statue of Paul Bunyan was constructed for the Flagstaff, Arizona café. Shortly after, muffler men began to pop up around the country and have been grabbing motorists&apos; attention ever since. In the world of muffler men, you&apos;ll find an assortment of sizes and personalities along the highways. These include original Muffler Men, Half Wits, Bunyans or Lumberjacks, Vikings, Pirates, Indians or Native Americans, Uniroyal Gals, Cowboys and miscellaneous personas such as Mr. Bendo, Big John, Pecos Bill and others. Learn more about Happy Half Wit and where you can find other muffler men at RoadsideAmerica.com, a site dedicated to mapping America&apos;s muffler men.